I constantly find myself in conversations concerning clear varnishes: the evil smells of petroleum based lacquers and enamels, yellowing of Dullcoat over time, and the difficulties of spraying Future for a gloss coat. Everyone seems to have suffered one disastrous outcome from clearcoats at one time or another. Recently, I’ve found a new product that I highly recommend. 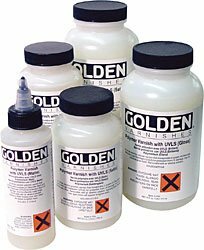 Golden Artists produces paints and mediums for artists, and have produced a very nice line of waterborne, acrylic varnishes. They come in flat, semi, and gloss, brush on easily, and can be thinned with distilled water for excellent performance in an airbrush. They also have the added benefit of providing UV protection, reducing fading and discoloration from most light sources. I’ve traditionally used Testor’s Dullcoat, decanted from a spray can, for my final dullcoat. I can attest that the Golden varnish, thinned with distilled water, behaves almost exactly the same as the Dullcoat, with none of the smell, easier cleanup, and hopefully no danger of yellowing over time. I picked mine up from DickBlick art supply. They sell it in various volumes, the 4oz squeeze bottle I purchased of each variety cost under $7 each, and should last many projects. And as with everything else in the known universe, you can also find it on Amazon.com. They also offer it in aerosol can, but I have yet to test this.